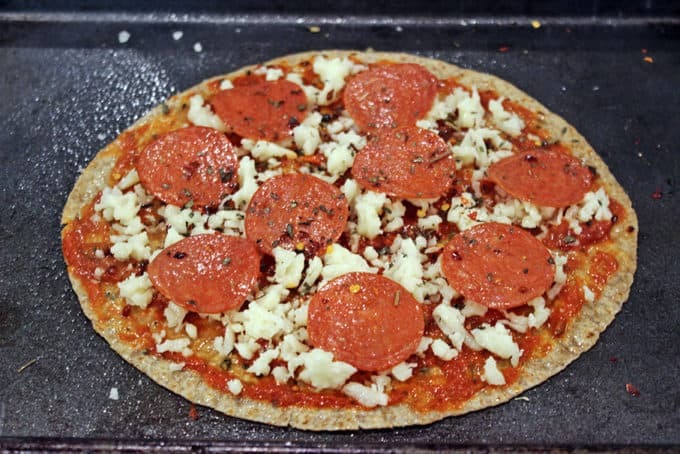 Pepperoni Pizza baked on a whole wheat tortilla with melty mozzarella and pepperoni, this pizza is satisfying! 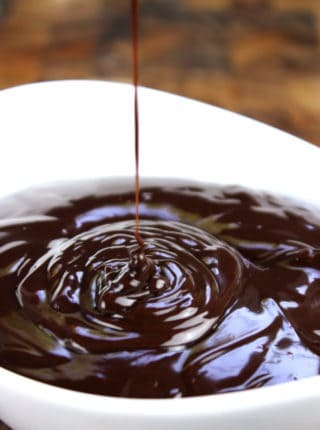 I put recipes up here for you all on a daily basis, most of which are pretty decadent or just “chef-worthy” in general. Truth is I’ve actually been watching what I eat since I had my youngest less than a year ago. I’ve had days where I make a recipe I absolutely love, take 4 bites of it and each a plate of steamed vegetables because I only have so many “points” left after a stressful afternoon of binge eating pretzel sticks while making sure both kids are alive and well (I don’t know why but our youngest is completely enamored with chewing on plugged in power cords). So when I posted this Weight Watchers Pepperoni Pizza on Instagram, I was just sharing my lunch and it became a hit on my Facebook page. 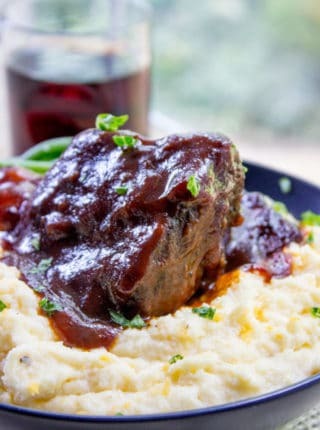 I tend not to share recipes that are dependant on a specific brand (this is not a sponsored post, btw), but in this case I think it is available over most of the country, so hopefully it won’t frustrate too many of you. The recipe is easy and quick enough. 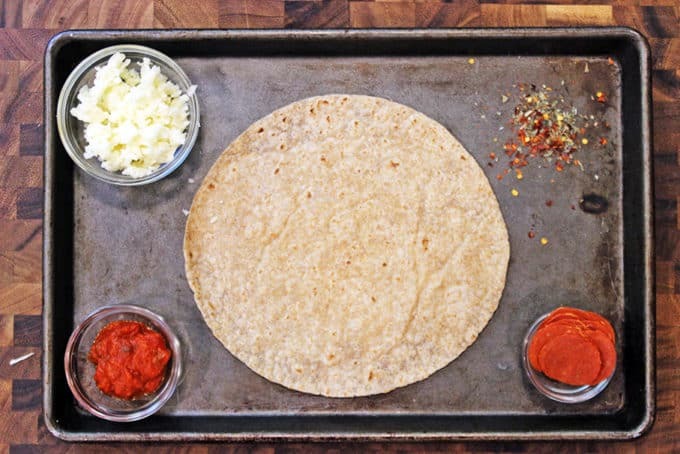 Preheat the oven to 425 degrees, take one La Tortilla Factory Wheat Tortilla, top it with 3 tablespoons of your favorite pasta sauce (I use Trader Joe’s marinara) and 2 ounces of Trader Joe’s Lite Shredded Mozzarella. If I can stop the directions for a second to discuss the cheese. This mozzarella is worth writing poetry about. It browns amazingly, when you pull out a slice of lasagna the mozzarella strings go on forever and it tastes as good if not better than any other normal Mozzarella I’ve bought. I kid you not, right now in my fridge I have three of them. We ALWAYS have them, even if no one is “dieting,” it is our go to. 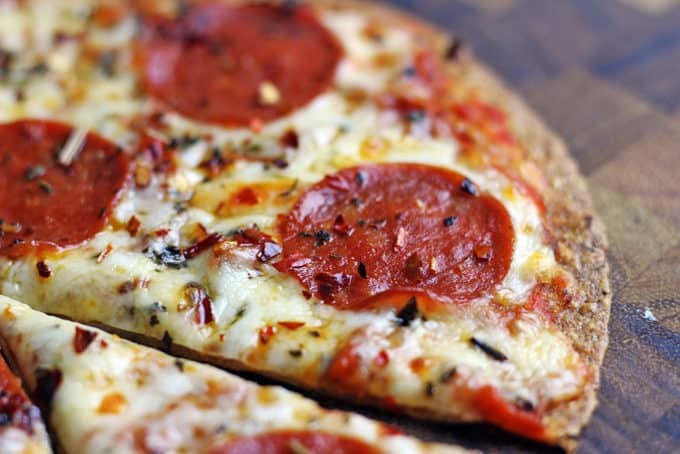 This cheese is the secret sauce that makes this Weight Watchers Pepperoni Pizza so amazing. 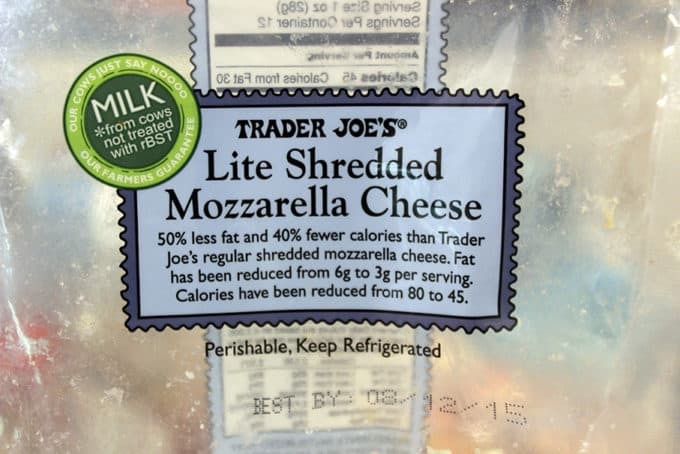 Don’t substitute for another brand of light mozzarella and then get disappointed it isn’t amazing. Go out and get this if it is within a reasonable driving distance for you! And the nutritional stats on it are a DREAM to a person watching their calories!! 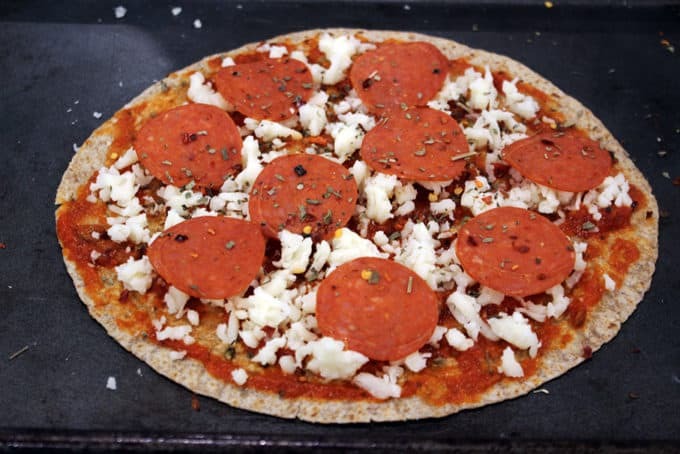 But I digress, where were we… Oh yes, tortilla, pasta sauce, mozzarella and now I use 8 slices of turkey pepperoni (I’ve looked at the labels and every turkey pepperoni I’ve seen is the same points for 8 slices) and top with some dried oregano and crushed red peppers (optional). Now here is where I recently changed the recipe. I found that the texture of the tortilla was not great when baked, so I tried a quick (I mean less than a half second) spray of canola oil on top. The difference was night and day! The flavor is wonderful with it! So once you are all topped and ready to go, give the pizza a quick spray and we can get baking! 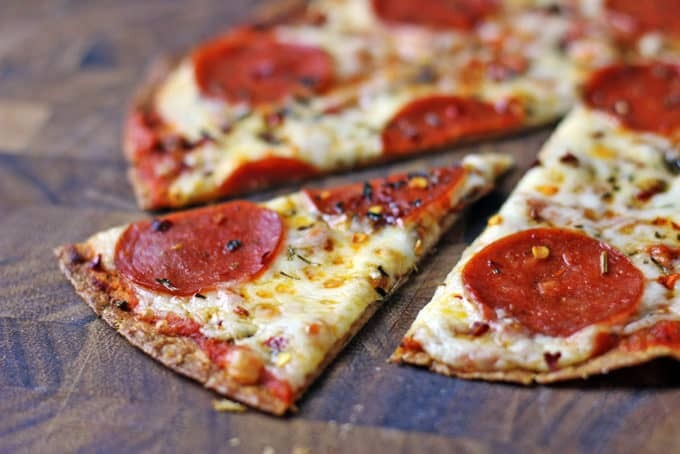 Bake the pizza on a sheet pan for 5-7 minutes. Watch your oven, by 7 minutes you should be all bubbly and browned. Let the pizza rest for 2-3 minutes when it comes out because that cheese is going to be like lava. I usually slice it into four wedges and eat it before my toddler discovers I made pizza. But if you want to feel like you are eating a delivery pizza, slice it into smaller triangles for bite sized slices. 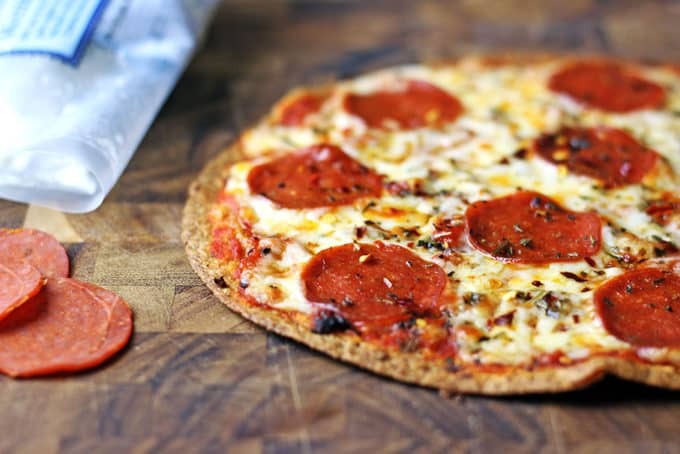 Deliciously melty Pepperoni Pizza baked onto a whole wheat tortilla for only 6 WW points! You won't miss your normal thin crust pizza after you try this for the first time. Let sit for 2-3 minutes before eating. 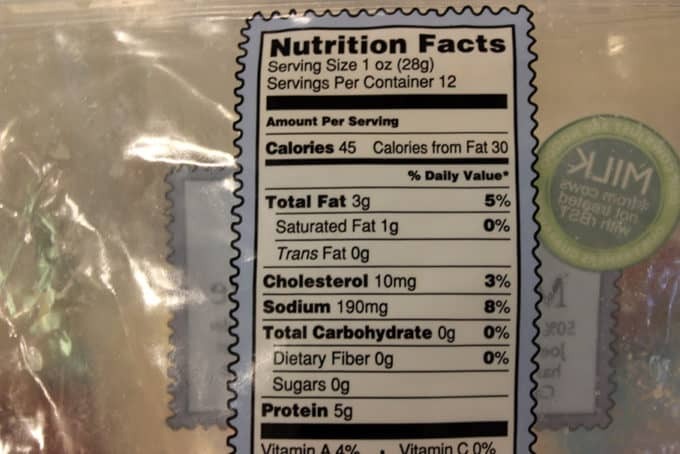 How did you calculate the nutritional values though i.e. it is showing 46 calories however the La Tortillas Low Carb Whole Wheat tortilla on its own is 45 calories. I’ve just recently started tracking nutritional values and want to make sure I’m doing so correctly. I actually use a program that once I add in all the ingredients, it calculates it for me. I’ll have to double check it, thanks. Would you mind sharing the program you use to calculate? It’s actually a plug in to the website that calculates it and not a separate program. I’m sure there are many online that you can use to help calculate when not attached to a website. I am on WW and I made this pizza last night and it was absolutely delish!!! Could I please have the calories in this please, not doing WW but watching what I eat. Oh my goodness! I was hesitant about using any tortilla for crust, let alone low-carb? This has to be one of the best pizza’s I’ve ever had. Dare I say…better than delivery? Definitely a lot healthier!! Thank you for the great recipe and tips! You’re so welcome, Sarah! Such an easy switch to still enjoy the taste but stay on track. Made this pizza tonight, was really good. Definitely satisfied that pizza craving. But I was wondering if there might be a way to make the crust a little crispier. So glad you enjoyed it! If you’d like it a bit crispier, allow it to sit directly on the oven rack for just a bit (watch it so it doesn’t burn). Hope this helps! DELICIOUS!! I just made these with Ole low carb high fiber tortillas. I sprayed the canola oil on the tortillas first and put them in at 425 for a couple minutes. Once I took them out, I spread with some garlic herb butter and then built the pizza. Back in for 6-8 minutes and PERFECT!!! While I was looking at this recipe, I wanted to read the reviews, It sounded really good. However, I don’t think I read any actual “review”. Most of the comments were about what it looked like or sounded yummy. I was super excited to make it! I went to Trader Joes and couldn’t find the lite Mozz, but they did have a lite blend and a fat free Feta, so I got both of those. Went home and made it for myself, since I am working on the WW Points. My boyfriend insisted that he have what I was having cuz it looked so amazing! I had to share so that cut my points in half 😉 I made it as a veggie pizza with mushrooms, onions, peppers and tomatoes. It was AMAZING! I can’t wait to make it again. The only thing I need to work out is the center of the tortilla was not crispy as I would like. 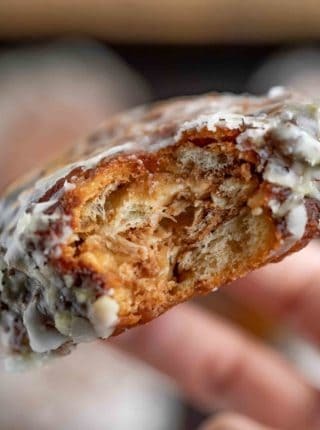 Even as a snack this recipe is awesome. I highly recommend it and it only takes minutes to make! Thank you so much for sharing this with us! So glad you enjoyed it, Mary! 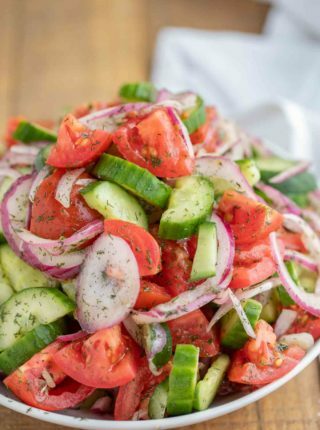 It’s one of my favorite quick and easy WW recipes and I just had to share it! This recipe is delicious! 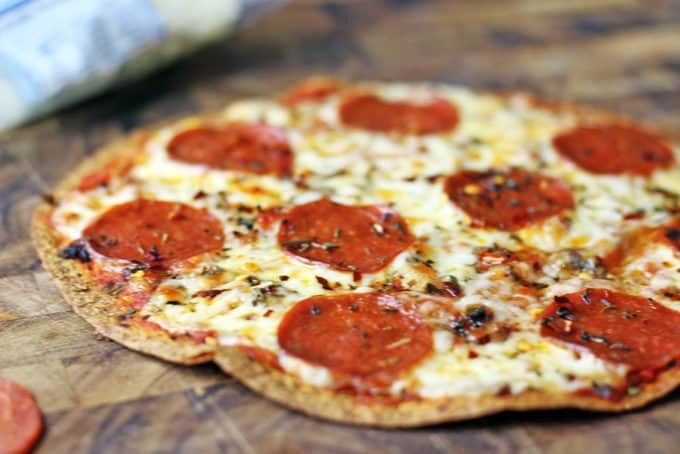 I use Kroger pizza sauce, mozzarella, pepperoni, mushrooms, and very thin sliced salami and Mission whole wheat tortillas with only 4 carbs. It is so good. Tried this with pepperoni and sliced tomatoes with Mozzarella cheese. Delicious. I’ve been on WW old points for 7 weeks. Lost 15 so far. Was hankering for Pizza so bad. Found your recipe made it but added a little pineapple to mine. Man I ate the whole thing it was so good.my tortilla was 1 point. Only 5 WW points. I will definitely try the cheese! I like to prebrown my tortilla just a little before adding the toppings, then add toppings, then put back into oven to finish cooking. This makes it less flimsy and adds more crunch in the end without having to use the oil. I’m sorry if you have already answered this but….is this 6 SmartPoints? Yes, sorry that it wasn’t clear. Hope you enjoy it! Just realized you answer this haha ! Sorry! the tortillas I use are kind of soggy. What kind of tortilla do you recommend to get it crispy? Thanks! You’re a life saver! I got into a horrible lunch rut, AND I’m craving pizza seriously bad! Usually pizza falls under that “junk food” list and I just write it off as a thing I don’t want to eat. I work hard to take off the few pounds I have lost, and I really don’t want them back LOL. So eating the same things every day…. ugh. I’m a person who likes a big variety. I get bored easily. So you can imagine my excitement to see this recipe! I even have everything on hand except the tortillas. I have some regular whole wheat tortillas, and they are a few more points, but I have the points to use, so it all works out! I’ve seen the tortillas you used at Walmart, so I’m going to pick some up next shopping trip. Thanks for a new lunch and a pizza for my craving! Fantastic! Glad I was able to help get you out of the lunch rut! I absolutely make this all the time. Love it. Yay! Thank you for coming back to let me know how much you love it! Ole extreme wellness taco tortillas are zero weight watchers points! It’s a great alternative! Just saw this, looks yummy! Just one question, what size tortilla? Thanks! I used a Large sized one for this recipe.